Beirut Cityscape. Source: Green prophet. amazing beirut is a new project by the beirut municipality aiming to pump up the green in the grey goo that is Beirut. According to the project's director, Nadim Abu Risk, the main strategy to achieve this target is to rehabilitate existing spaces like public gardens, roundabouts and sideroads. 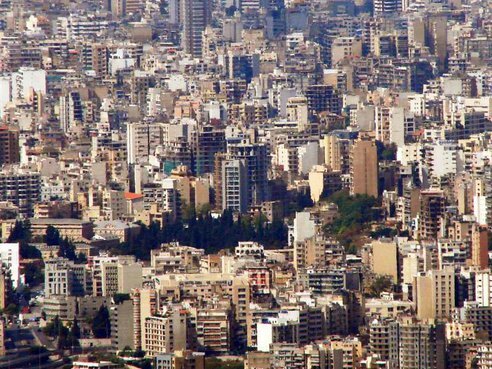 In order to achieve a green Beirut i would argue that the strategy should be to aggressively acquire and convert the last open spaces in Beirut to green urban parks- using PPP( public private partnerships), rather than just rehabilitate the few micro-parcels the city already has . To establish a green consciousness among citizens is to give them significant green space for their recreation, and to install among them this culture to go to an urban park to relax. Are roundabouts and sideroads and existing gardens spaces of relaxation/recreation? I doubt that. Such gardens are so tiny one can still hear the horns and inhale the CO2 emissions of the nearby road. One cannot even start a 5mn walk due to the small size of these garden. and these gardens' catchment area will definitely not expand after rehabilitation. Looking at the 0.8% percentage of green m2 per person in Beirut ( we really have this much? ), The municipality should get Beirut new urban parks of consistent size, to be rightly called its green lungs. Why not use the railyards of Abed and Mar Mikhael Station as temporary urban parks? Why not rehabilitate the sewer that is Nahr Beirut to a green corridor? What about Horsh Beirut that remains closed to locals but open to tourists? It is not enough to talk about rehabilitating Beirut's tiny little gardens in order to improve the current situation. We need drastic measures, at the scale of the city. We need campaigns to pump up environmental consciousness and behavior.We need pedestrian mobility and less car-centered streets. The way the municipality is approaching the issue, the "amazing beirut" project is way too shy to be relevant. its outcome will certainly remain far from fulfilling Beirutis' deprivation of public green space. its honorable intentions are not coming with the right scale of action that is much needed.